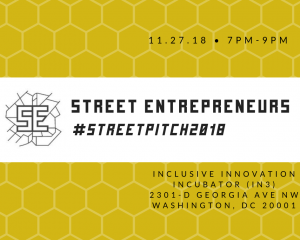 Mindhatch is pleased to announce that we are joining forces with Street Entrepreneurs to celebrate Washington D.C., Maryland, and Virginia’s diverse entrepreneurs. #StreetPitch brings together the grittiest founders from the area to a stage where they will present their companies for the opportunity to crowdfund from the audience. At Mindhatch, we take pride in supporting #StreetPitch2018 and Street Entrepreneurs, an accelerator that is intentional about underrepresented founders. This year the SE cohort broke down as follows: 50% Black, 20%, Latino, 5% Asian, 58% women, and 13% LGBTQ. Because we believe in collective impact, we are partnering with Street Entrepreneurs to give these founders the platform they deserve. The premiere event will also feature American Sign Language (ASL) interpreters, courtesy of Gallaudet University, in order further accessibility. Sign up here to reserve your spot in our community audience. Come ready to invest in grit!